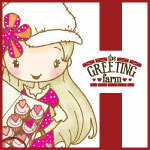 It's July 1st and that means today is all about a brand new Farm Fresh Challenge at The Greeting Farm! As you know, a new challenge is issued at the beginning of every month over on the TGF blog and this time around it is... 'H2O Love'. We are in those dog days of summer and what better way to keep cool than with some good ol' fun in the water? There are so many great images in the TGF store that work with this theme and a few more are due to swim on to the scene in just a couple days. 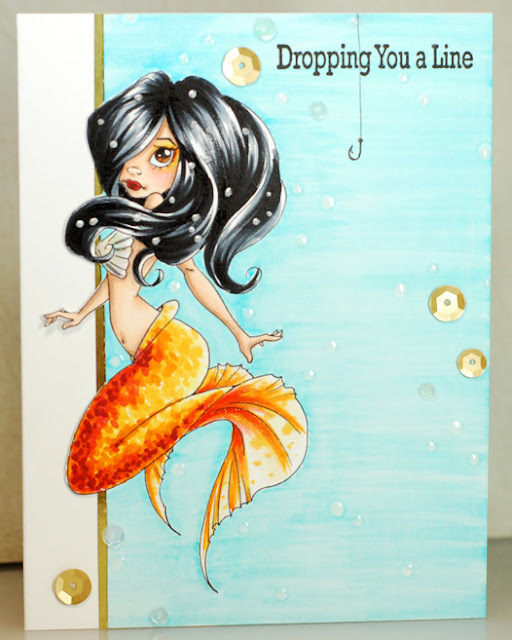 So get creative and show us your best water themed cards... playing along just might win you a $50 gift certificate! Since I kicked off this 'month of mermaids' with one of the darlings by Elisabeth Bell I figured it would be the perfect bookend to wrap it all up with another one of these sweet mermaids. This one is called Splish Splash and it looks like she has just swam up out of the water to rest on that cool stone seat. Her wet, dripping hair really inspired me to create a waterfall behind her. To do that, I masked her off then grabbed my Distressed Patterns stamp set and stamped the sketchy lines stamp repeatedly behind her in a very light blue ink. I then added the white sequins to mimic the frothing water at the bottom of the falls. 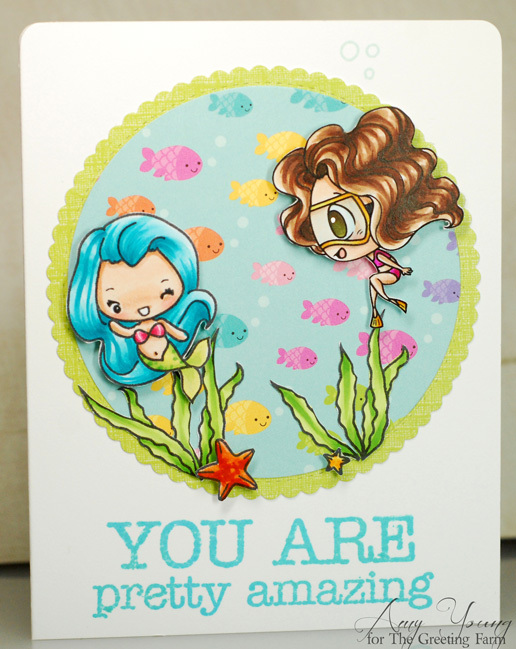 Something about Splish Splash had me going in a 'thinking of you' direction for my card as well as a more muted color palette. There is just something very quiet and gentle about this little beauty. Today was my turn to create a card for the TGF blog and I had one last Mer Bean left to be inked up so this was the perfect reason to finally get little Oona on a card of her own. 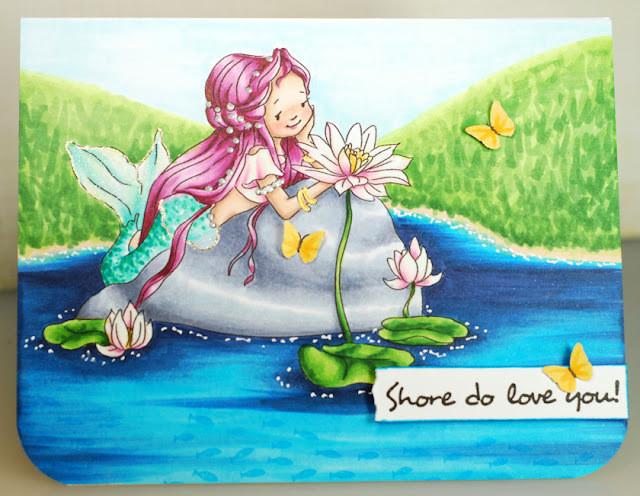 This sweet girl looks like she has a lot of love to share, as well as a sea shell or two, so I wanted to create a scene where she would have a friend to keep her company. 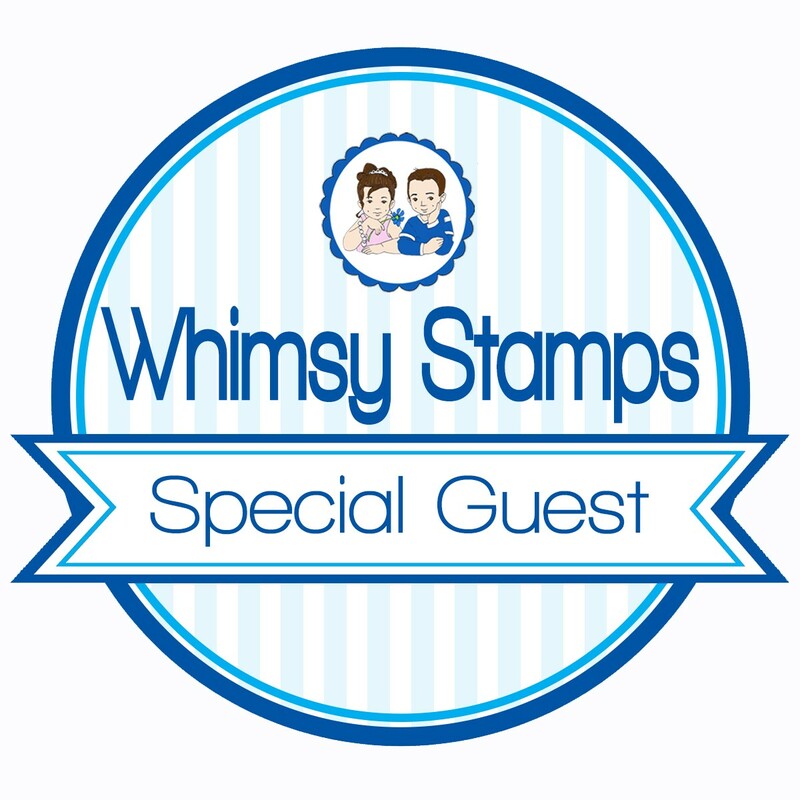 At first I was looking through my various stamps sets to see who I could find to join Oona but ultimately I saved time stamping and coloring by simply using these super cute stickers from Doodlebug. 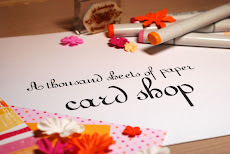 Talk about easy peasy and I just love it when I manage to create a cute card in record time as well as use up some more of my crafty stash! Did you see the happy news? 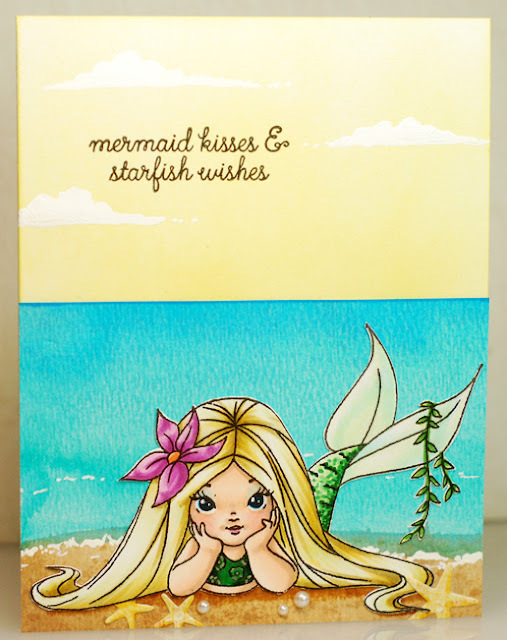 My wish on Friday's post for Pixie Mermaids from Tiddly Inks has come true in record time! 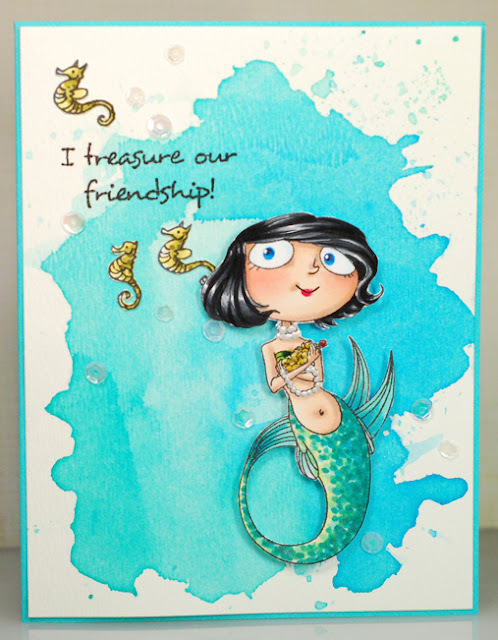 Christy has created a set of six amazing mer pals called Amy and her Mini Mermaid Friends and I'm totally flattered to have inspired these cuties. 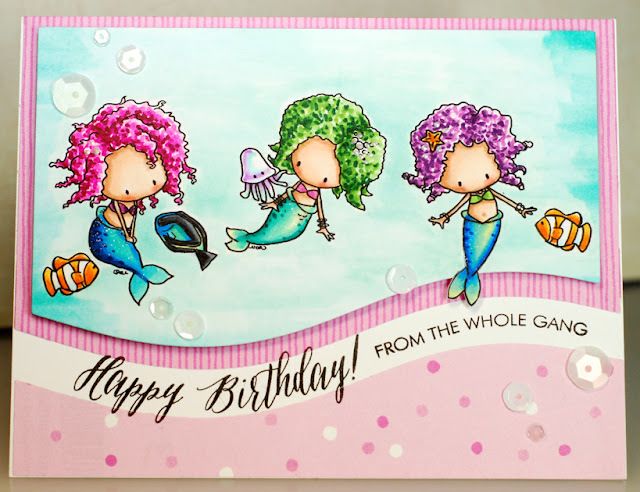 I love them all so much that I couldn't decide on just one for my card today so I put a group of them together and created a little mini mermaid party. I mean seriously, how cute are they?! I'm also entering this card into the current "tingo challenge" with a pattern paper, Tiddly Inks image, distressing combination. Anywho... today's card features the gorgeous new Serena Sparkles from Kraftin' Kimmie Stamps. I look forward to their mermaid release every year and I've yet to be disappointed. Serena originally comes with a much wider grin on her beautiful face but once I decided to use the dreaming sentiment I decided to do a small alteration to her mouth so that she would look more wistful and dreamy. 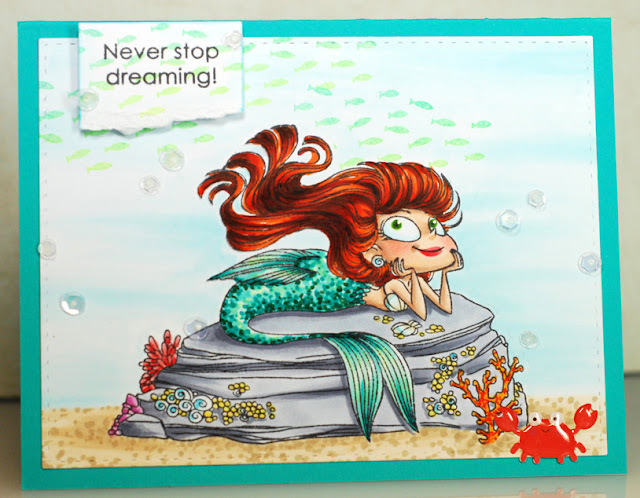 Then I went for a traditional Ariel color scheme with her red hair and aqua hued tail because Ariel was always a dreamer. 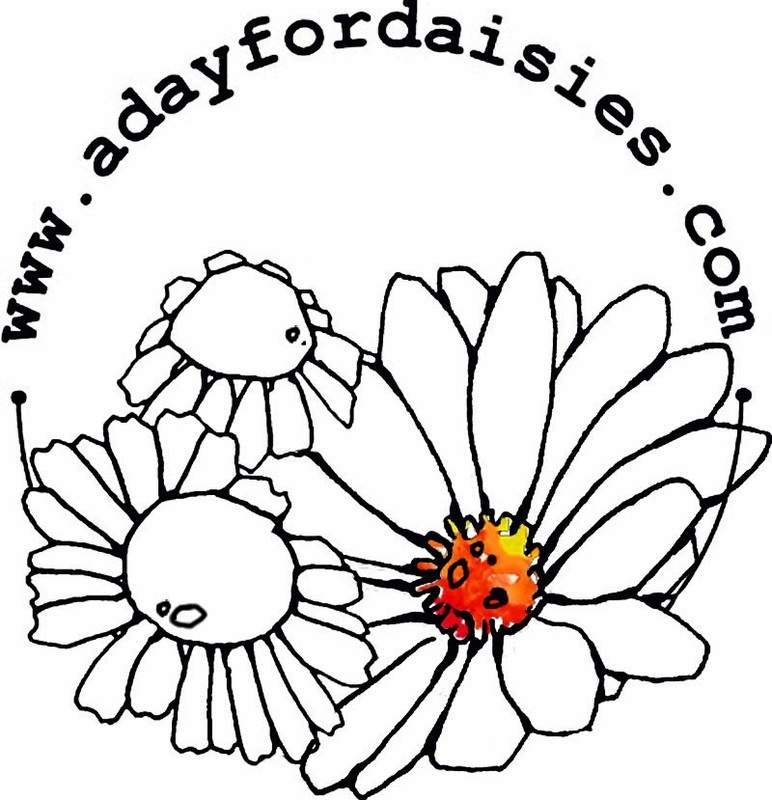 I'm also going to throw this in to the Wonderful Wednesday 'anything goes' challenge and try my luck there. I needed something quick to color yesterday as my day was quite busy and there wasn't a lot of time for coloring. I looked through all my mermaid stamps and everything was looking a bit too involved. It got me wishing that there were some pixie style mermaids from Tiddly Inks. Hmmmm... 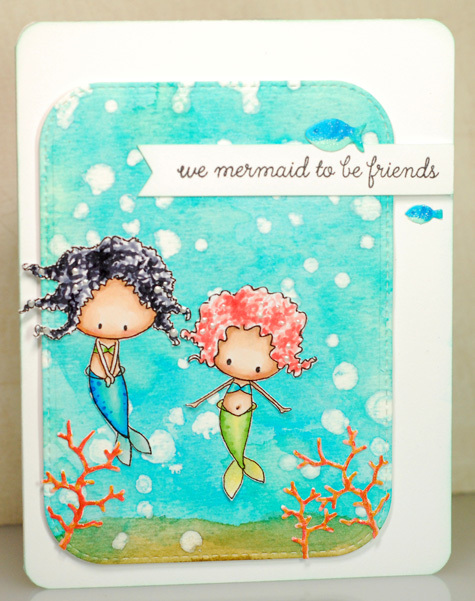 I have an old stamp set of Tiddly Inks pixies that was sold by Stamping Bella, it probably wouldn't be too hard to wipe away their bodies and draw in new little mermaid tails. OMGoodness, why have I not done this alteration sooner? 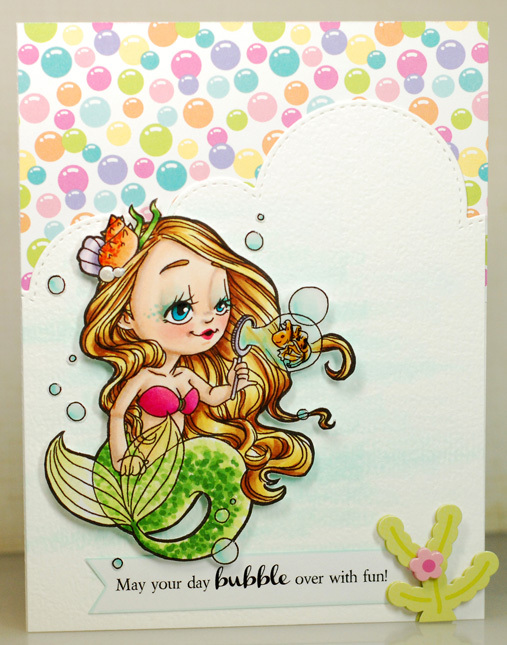 They are SO stinkin' cute and now I'm totally hoping that Christy Croll will make a few mermaid pixies for the store someday soon. Fingers crossed! I'm really on the run this morning so I'm going to have to make this post short and sweet. Pearl, the gorgeous mermaid from Saturated Canary has been waiting ever so patiently for me to print her out and get her on a card. For some reason when I sat down to color I saw her with a goldfish tail so out came the yellows, reds and oranges. And what would a goldfish card be without a few touches of metallic gold added to the design as well? Luckily I had the gold sequins still sitting right in front of me and a thin strip of gold cardstock to pull it all together. I made the 'bubbles' in the background by letting my colorless blender rest on the paper, pushing the blue out. Then I just added drops of glossy accents over the white spots and I had instant bubbles. Alrighty then, gotta go. TTYL! 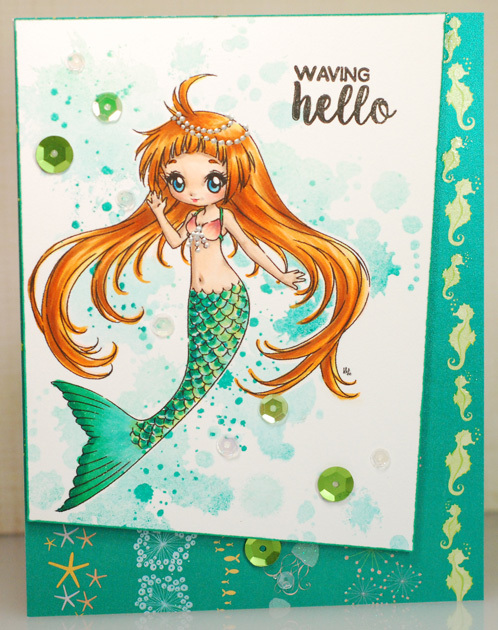 I grabbed this freebie Mermaid digi off the ADFD blog last summer and I'm finally getting her on a card for this year's month of mermaids theme. She seems so peaceful and reflective that I wanted to keep the colors of the card soft and muted to help with that mood. The sentiment comes from a little Papertrey Ink set and again I think it really works with this sweet mermaid's vibe. 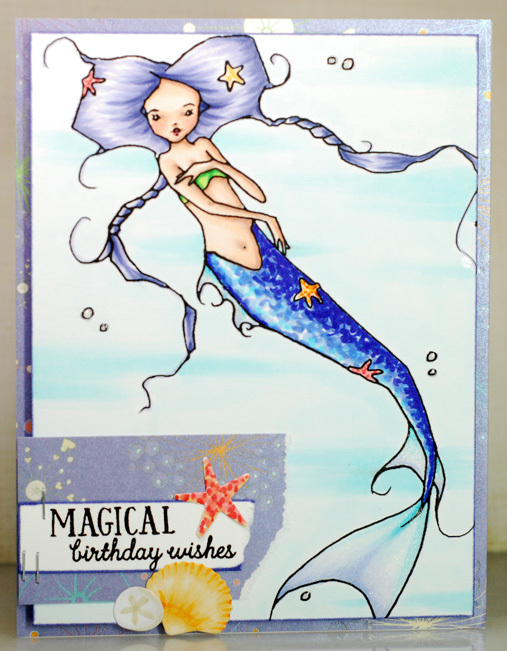 I added some Eucalyptus Stickles to her tail so that it would be extra glittery and I could enter this card into the current "add glitter" challenge. 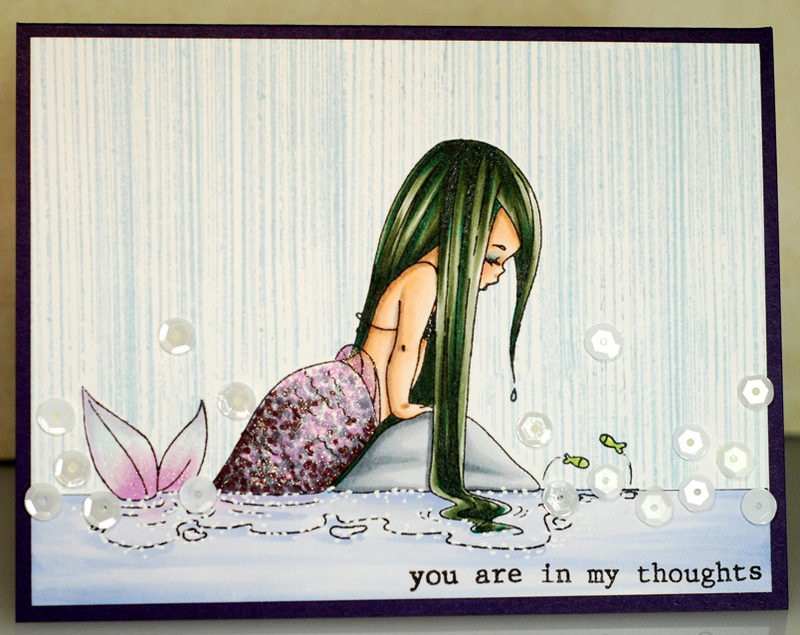 Then I just added a few die cut seashells and a sprinkling of sequins to pull it all together. 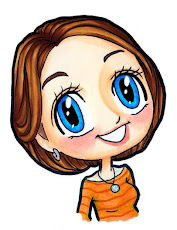 My bloggin' buddy Heidi recently added me to a new Facebook group called Markers! Papers! Digis! 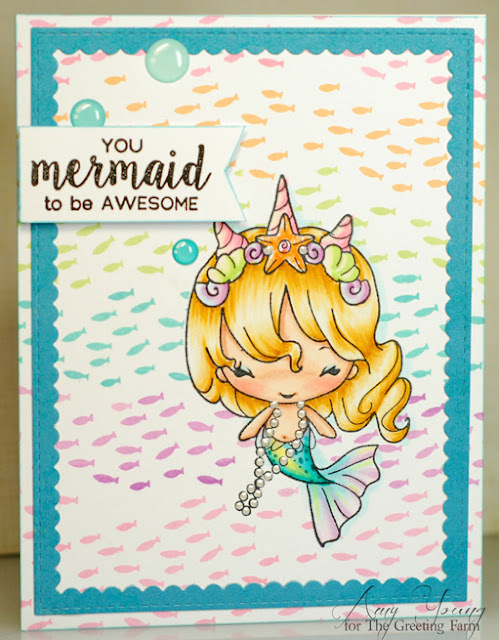 and to celebrate they have a few mermaid digi freebies until the end of the month. Well talk about perfect timing... as soon as I saw this gorgeous mermaid called Seeana by Amanda Byron I knew that I had to get her on a card for my month of mermaids. So I printed her out nice and big and just had a blast coloring her up. Once I had Seeana looking all bright and beautiful it didn't take much else to finish off the card... a bit of paper here, some sequins there and a die cut or two and voila! 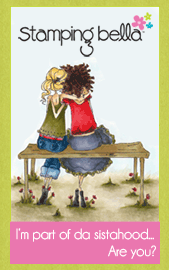 Thanks Heidi for introducing me to this fun new group and some great new digi stamps! 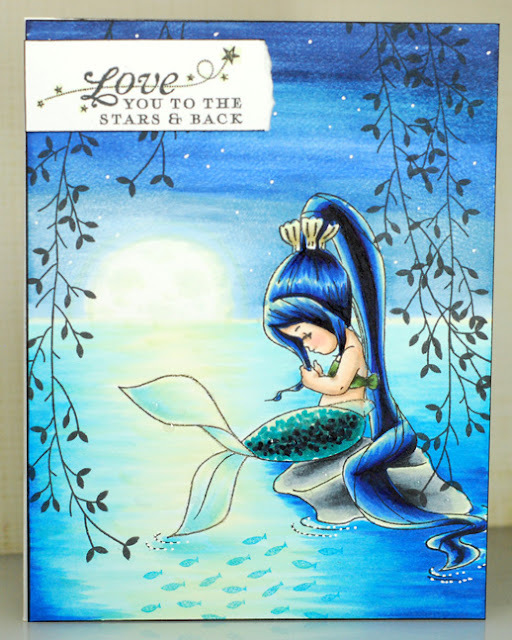 I still had a couple SOG mermaid digis printed out and sitting on my desk just waiting for their chance to swim into this month of mermaids and Sea Song Mae won the day. 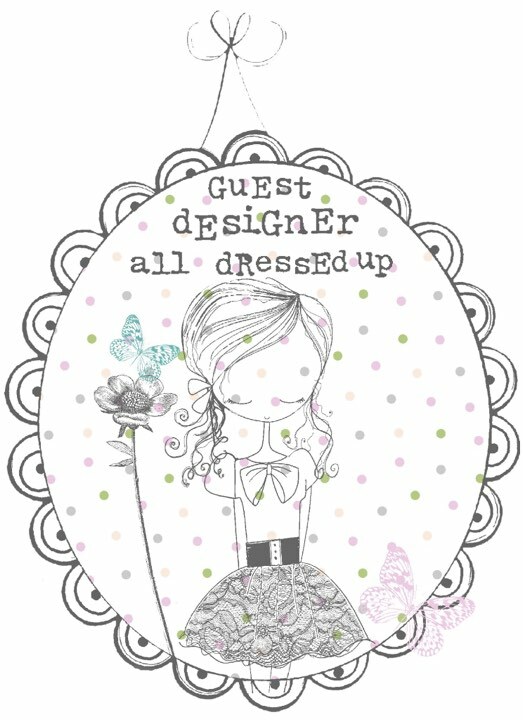 I also noticed that the current challenge over on the SOG Facebook fan page was to decorate a tag which was the perfect excuse to finally use this big tag that I got in a card kit years ago. I actually grabbed a Christmas themed border stamp set because I thought a couple of the borders, stamped and colored up in shades of green, could make for a fun kelp looking background. 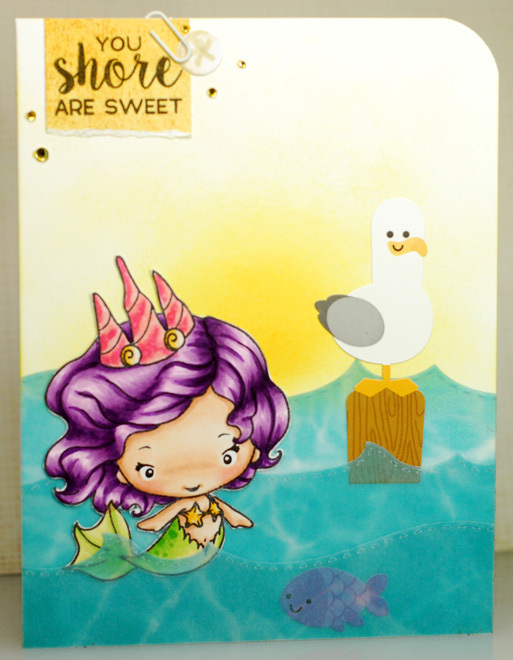 Then I just had a blast coloring up Sea Song in some funky, darker hues so that she would really make a statement on this relatively simple card. Alrighty folks, enjoy the weekend! Ok friends, I'll see ya tomorrow! Alrighty time for me to scoot on into a new weekend... have a good one! Alrighty, I'm outta here. Talk at'cha later! 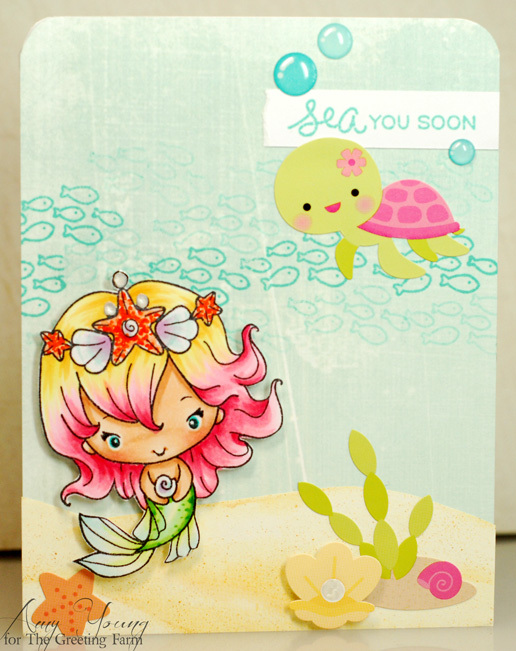 It's day 2 of my 'month of mermaids' and I chose to print out the lovely Water Lily digi from Sugar Nellie. 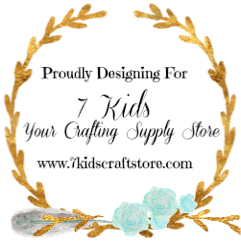 She's a recent purchase in preparation for this month's theme and she's currently on sale right now because before too long Water Lily will be discontinued and no longer available. Another mermaid daydreaming on a rock and once again I was inspired to color an entire scene for her. This time I went with a mid day look and gave Water Lily an inlet to call home... it looks so peaceful, don'tcha think? 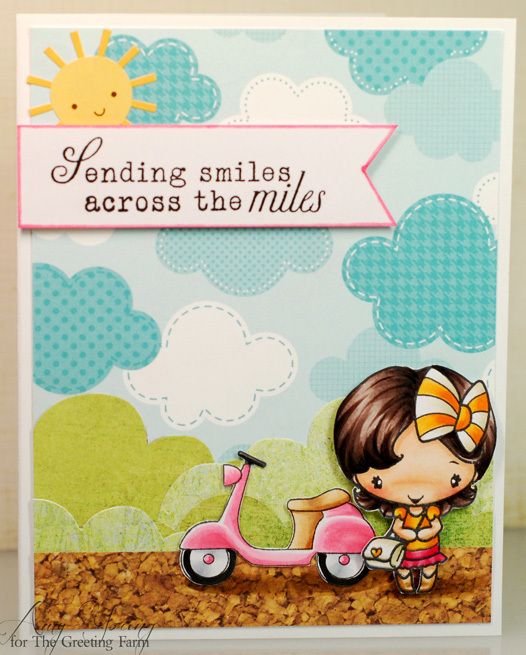 And I'm also entering this card into the current Anything Goes challenge at The Sugar Bowl. 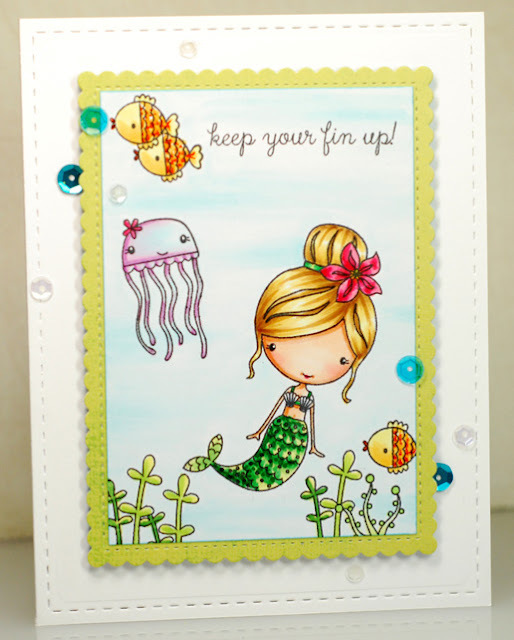 So today I am jumping into the water with a lovely mermaid from Sweet Pea Stamps called Glimmer. I missed out on her back in 2013 when she and her sisters were released but I was lucky enough to get my hands on a few just in time for this summer's cards. As I inked up Glimmer I suddenly saw her in a moonlit night scene for some reason. Pulling off the background was definitely a challenge but I enjoy stretching my creative muscles now and then. And I gotta tell ya that I don't think I've used this many blue Copics on a single card before, LOL! 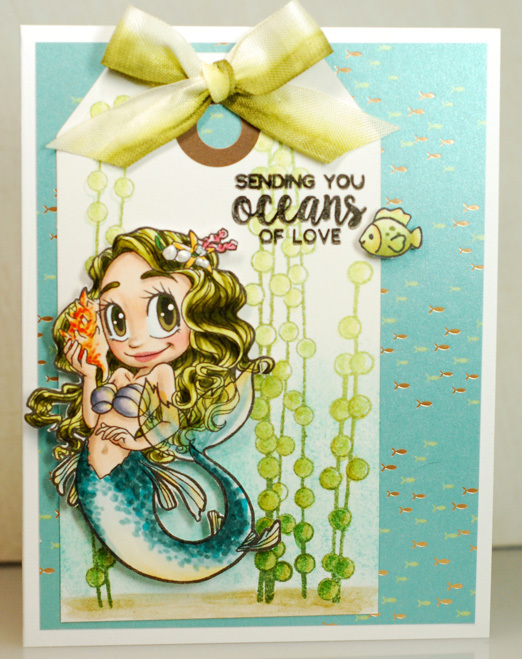 Once I had the sea and sky colored in the card still looked incomplete so I grabbed the little school of fish stamp and the willow branches which totally did the trick. Now Glimmer looks like she is resting in a hidden cove with only the stars looking down on her.